Go handheld with any standard microphone suspension! 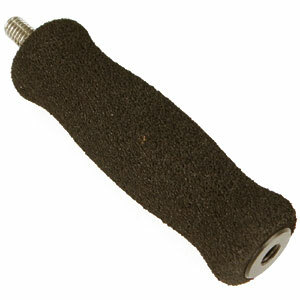 Made from machined Delrin, stainless steel, and expanded polyurethane, this foam padded handle grip comes with a 3/8″ threaded stud adapter (boom pole standard). The Grip is also threaded at the base so it can attach to a boompole. The padding also provides significant additional shock isolation. Now you can hand-hold a PSC mount, Audio-Technica AT8415, AKG H100 spider mount, etc., with increased isolation.